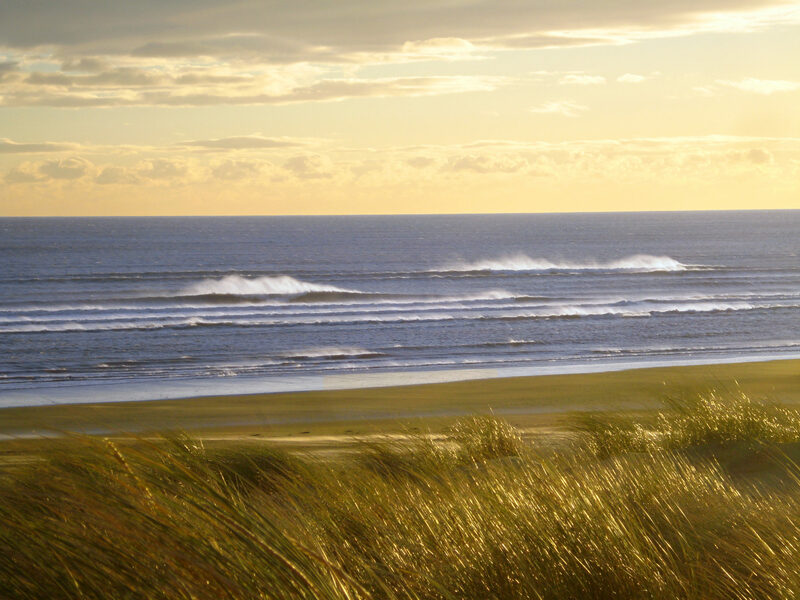 Camber is widely known as one of the best beaches in the UK for kitesurfing. With miles of sandy, flat beaches and consistent southerly winds throughout the season, it’s a kitesurfing paradise on your doorstep. The wide sandbanks also allow for plenty of room for activities such as kitebuggying and landboarding, whilst the sea and nearby river offer great chances for stand-up paddle boarders to cruise around exploring or catch some waves. Offering conditions to suit both beginners and advanced riders, there’s plenty of room whether you’re learning your first board starts or boosting high above the waves. Nearby Greatstone, though less well known, offers fantastic conditions when the wind is off-shore at Camber. With a huge flat beach and waist deep water for hundreds of metres, it’s fantastic for beginners and means that it’s highly unlikely a trip down will be wasted – with both Camber and Greatstone to teach on we can run lessons and hire out equipment in almost every wind direction. 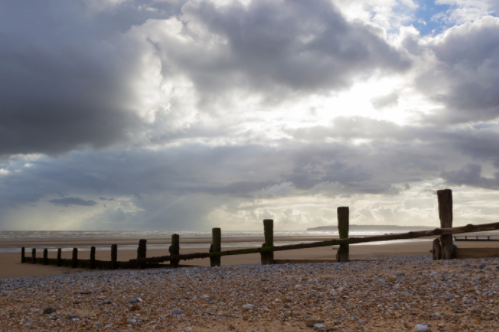 We chose to make Camber our home 10 years ago and it has proved to be a fantastic decision. The kiting community here is one of the friendliest in the country; events and demos are packed with enthusiastic kiters of all ages and abilities and there’s always someone about to give you a hand with landing or launching. Camber has even attracted the attention of the pros with Aaron Hadlow and Lewis Crathern making appearances at events. With two fantastic, differently facing beaches within 10 minutes of the centre we are in an unrivalled position for teaching in the UK. Add to that the consistent thermal winds and beautiful views and it's easy to see why so many people choose to continue kiting here once they have learnt. 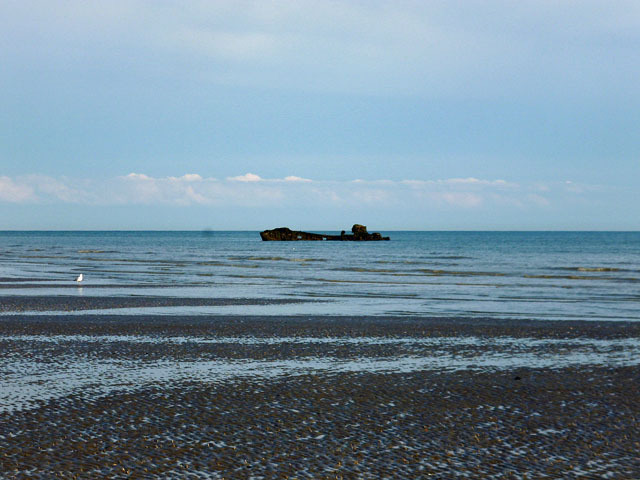 Camber is easily accessed by car, train or bus and is just an hour South of London. If driving, Camber is situated close to the M20 which provides a quick and easy route to London and the North, whilst the A27 along the coast gives access from the South West. There are several groups such as the London Kitesurfers Association which regularly visit Camber and offer ride sharing, and we often find our students are able to get lifts home with others in their group as they will often be making the same or similar journeys. Nearby Rye train station is serviced by regular trains from Ashford (for London) and Brighton, with trains from London every hour until around 9pm. Rye is just 5 miles away from Camber; taxis run from outside of the station, regular buses from opposite the station stop at The Kitesurf Centre on request and there is also a dedicated cycle path which goes all the way to Camber, allowing the more adventurous of you to enjoy some of the local scenery on route. 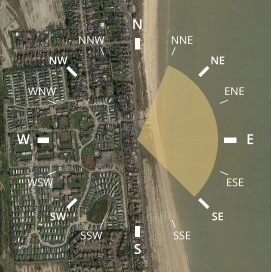 Due to the difference in speed at which the land and the sea heat up, during the summer months Camber has thermal winds which can add an extra third onto the wind forecast, meaning strong and consistent on shore wind for 95% of days during the main kiting season (April – October). In the off season (November – March) there are still plenty of days with good, on-shore wind and the sea stays surprisingly warm. 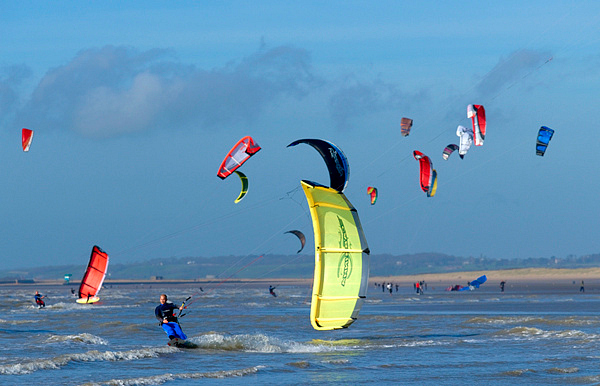 With two differently facing beaches, Camber and Greatstone, you can kite in almost any wind direction here. 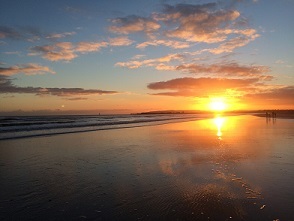 The main beach, Camber, is useable in any direction from East South East clockwise round to West, whilst Greatstone can be used from North North East clockwise round to South East. 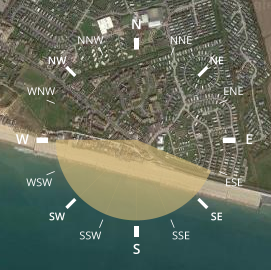 At Camber, it is not possible to kite for 2 hours before and 2.5 hours after high tide. This is due to the water coming right up to near the sea defences, meaning there is no room to safely launch or land your kite. The water also gets much choppier at high tide. At Greatstone, it is only necessary to leave 1/1.5 hours either side of high tide. 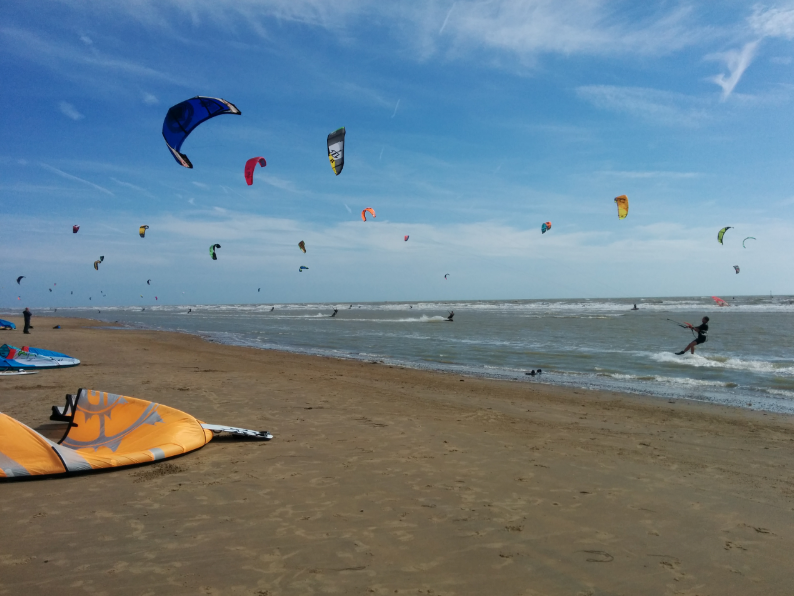 At Camber, launching is mainly done from the area of the beach directly in front of The Kitesurf Centre. Here, there is plenty of space at low tide for launching safely. There are a few hazards kiters must be aware of at Camber, but all are easily avoidable with a few precautions. A safe rule is to ensure you are double the length of your lines away from any hazards. When launching and landing your kite or using the beach for activities such as buggying, it is best to stay as far away from the sea defences and groynes as possible. Up to 2.5 hours either side of high tide there is plenty of room on the beach to avoid these, even if it does mean a short walk to find a clear space. During the summer months the beach can be very crowded. Though tourists and non-kiters tend to stay to the western end of the beach, the area in front of the centre is often used by those with dogs as they are not allowed on the main beach. Most of the public will stay away from kiters, but this is not always the case, so be sure to check around you before launching or landing your kite. There is a shipwreck slightly to the East of the centre in the main kitesurfing area. 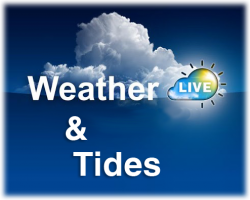 This breaks the surface of the water for a time as the tide goes out and should be avoided if any part is visible. When the tide is in far enough the shipwreck is completely submerged and is safe to kite around. Occasionally, members of the public will swim in the water. It is best to (politely!) advise them that this is not a safe area to be swimming in and ask that they move towards the tourist section of the beach. Should they choose to stay in the water they do so at their own risk, so the best you can do is avoid them as much as possible. 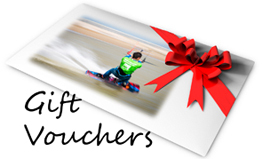 Especially during the main kitesurfing season, there can be several learners on the water. Though they are with an instructor, it is important to remember that these people may not have sufficient kite control to avoid a collision, so the responsibility is then on you to avoid them. Beginners are taught in the designated teaching area, which you should never kite in as an independent rider. 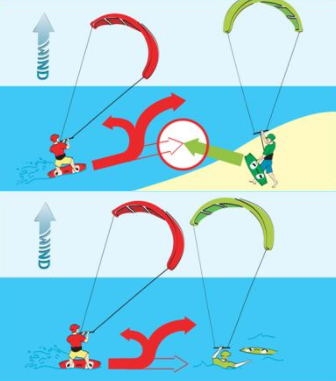 They are then allowed to kite in the main kitesurfing area only once they have reached a certain level of proficiency. However, as they are still the less advanced rider it is best if you actively avoid – them they will be easily visible as they are required to wear yellow helmets. Remember – it is always everyone’s responsibility to avoid a collision, regardless of the level of rider. Make sure you follow the Kitesurfing Rules of the Road. 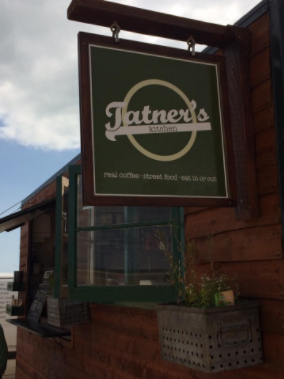 During the summer months, Tatner’s Kitchen food trucks operates from the car park at The Kitesurf Centre selling amazing food with a constantly changing menu – we’ve tried pretty much every option, trust us – it’s seriously good! He also serves tea, coffee and cold drinks. There are several cafes, restaurants and pubs in the main part of Camber, which are approximately a 15 minute walk from the centre. At the centre we have bottled water and snacks such as flapjacks and chocolate bars – great for a quick energy boost before a lesson. If you’re looking for somewhere to have dinner after a day of kiting then local pub “The Owl” is a great option and just a 5 minute drive away. 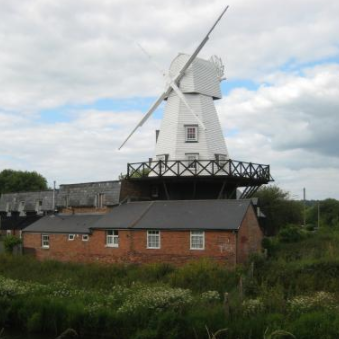 There are plenty of accommodation opens nearby, from boutique hotels, windmills or B&Bs in listed buildings to camping in yurts and everything in between! Several of our instructors also rent out rooms in their houses for our customers. You can find a list of the accommodation in the local area on our website here. Be sure to mention “The Kitesurf Centre” when making your booking as some places offer discounts of up to 25% for our students!